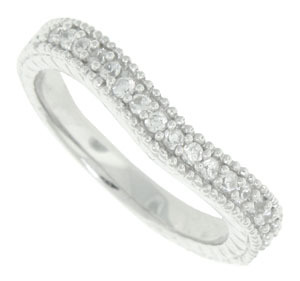 Faceted round diamonds are set around three quarters of the circumference of this 14K white gold curved wedding band. The top and sides of the band are covered with engraving and edged with milgrain decoration. Photographed with R2468 (sold separately). 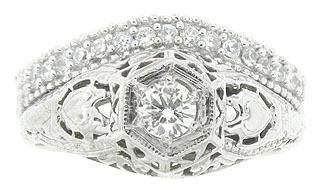 The ring measures 3.10 mm in width. Size 6. We can re-size. Frequently purchased as a set for $1500, but can be purchased individually for $750. 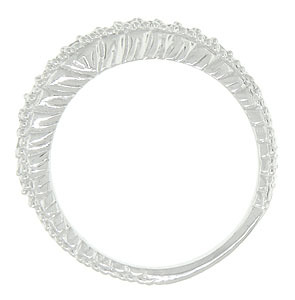 Bands can be special ordered in any size and are also available in 18K, yellow gold and platinum.